and c. because I must let you know more about this awesome cookbook of hers. Over the years I’ve cooked a number of recipes from Brandi’s blog, all of which have been absolutely delicious — especially since both Brandi and I share a love for potatoes, tahini, chocolate, and lots of flavor :P When readers email me in asking for recommendations for savory food blogs, Brandi’s is one of the ones always on the list. Her recipes are just very simple, comforting, and wholesome. You can see some of the recipes from the book in the quick leaf-through I shared on Instagram earlier this week. 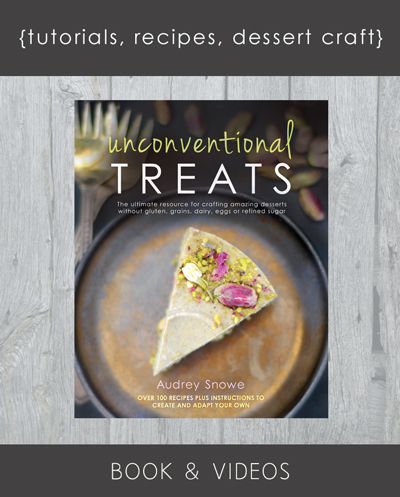 All of the recipes in the book are 8 ingredients or less, and consist of mostly whole foods. 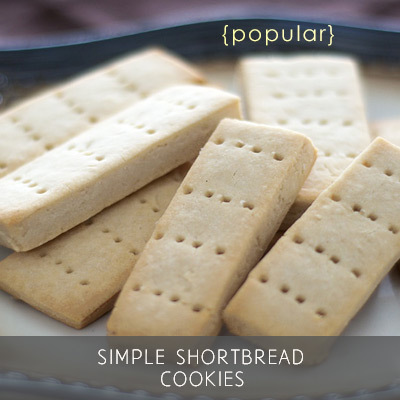 Most are also gluten-free and oil-free. Lots of savory dishes, sauces, and appetizers, but also crepes, pancakes, granola, muffins, cookies, cake, and more. Back to this cake though. 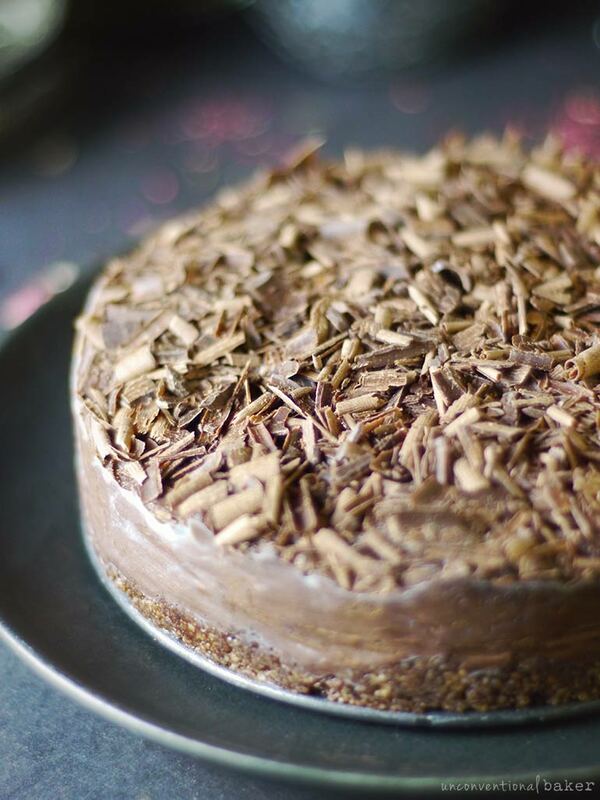 If you’re into dark chocolate, and espresso, and fudgey goodness, this cake is for you! It’s incredibly rich and satisfying. 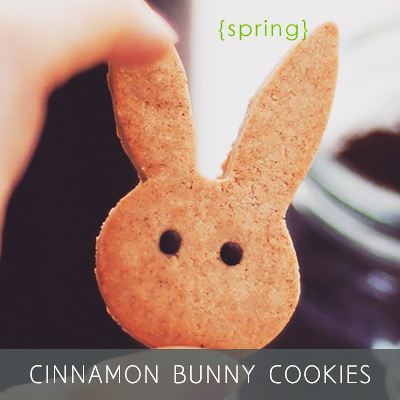 It goes amazing with a cup of coffee, or just a plain cup of mylk. 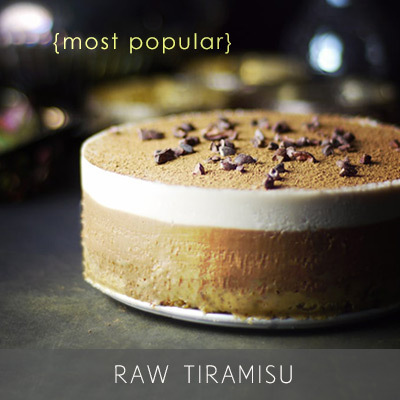 I love that it doesn’t use cashews — so a yay for those looking for more cashew-free vegan cakes. And I love that it’s a fridge cake, and not a freezer cake — it holds up better longer unrefrigerated than a typical raw cake. I did like mine sitting on the counter for some time to soften out a little more though (it’s freezing cold where I am right now, so things will stay firm even outside of the fridge…) — it made it soft, and velvety smooth. 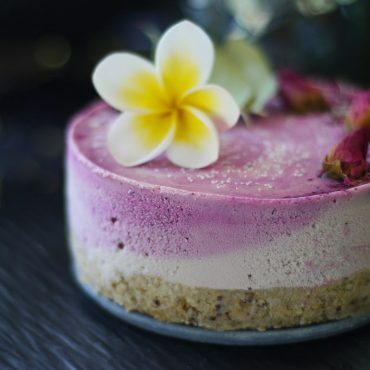 Another bonus is that it doesn’t require a blender, so if your blender has been struggling with typical raw cake recipes, so long as you have a good food processor for this cake you’re in business. Just a quick note about something I had to do different than the recipe recommends: I don’t have a microwave, so a few parts needed a workaround. I melted the chocolate using a double boiler method instead. (Just make sure to let it cool off just a touch before adding it to the processor so it doesn’t melt or overheat your processor). I also had to keep my chocolate curls finer than Brandi’s original tip instructions (which involved a brief microwaving of the chocolate to soften it just a touch so the curls shave off nice and long) — admittedly her chocolate curls look absolutely luxurious in the book photo, but you can also make cute little chocolate shavings from an unheated chocolate bar instead if you don’t own a microwave as I’ve done here. I’m going to type out Brandi’s instructions as they are in her book in the recipe below though, just wanted to share the above in case you’re like me and don’t have a microwave around. 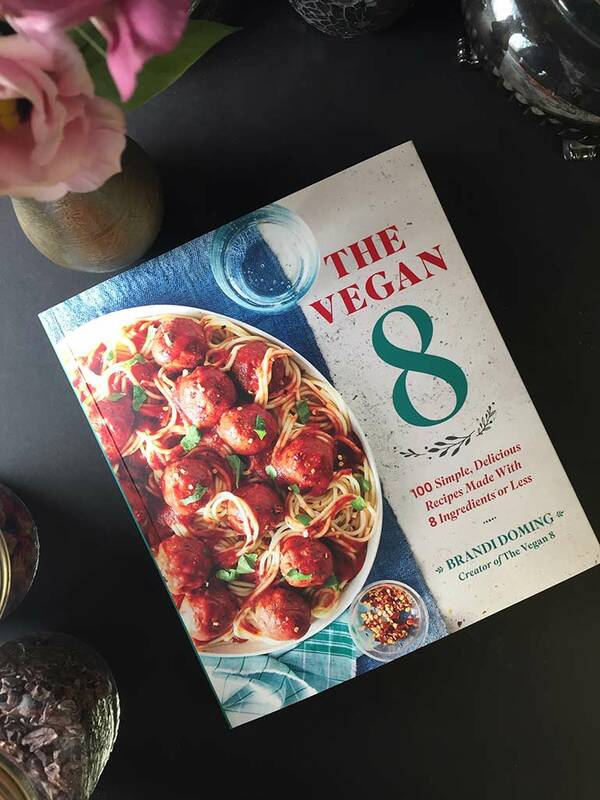 The Vegan 8 Giveaway: (CLOSED — thank you all for the wonderful suggestions. It was extremely difficult to choose a winner amidst so many delicious ideas. The book went to John and his Mojito Chocolate bar suggestion). If you could invent a unique new vegan chocolate bar flavor, what would it be? I’ll pick a winner based on the chocolate bar idea that I think is the most interesting and delicious. Feel free to suggest multiple things, or even come back and comment again if you think of something new after a day or two. All comments must be entered in by no later than Wednesday Nov 21, 2018 (11:59PM EST). I’ll come back here to announce the winner after that point. Please make sure you leave an email address you actually use in the email field below your comment (not within the comment itself) so I can get in touch with you if your chocolate bar idea is the winner. I’ll contact the winner by email go obtain your mailing address by Nov 23, 2018 — you’ll need to respond within 1 week of receipt of the email, otherwise the book will go to the next person in line. Can’t wait to hear of all your amazing suggestions! And if you’re not in the US or Canada, I’d love to hear your suggestions too (I mean, it’s fun to dream up new chocolate flavors, isn’t it?) — just specify in the comment that you’re not in the giveaway zone. 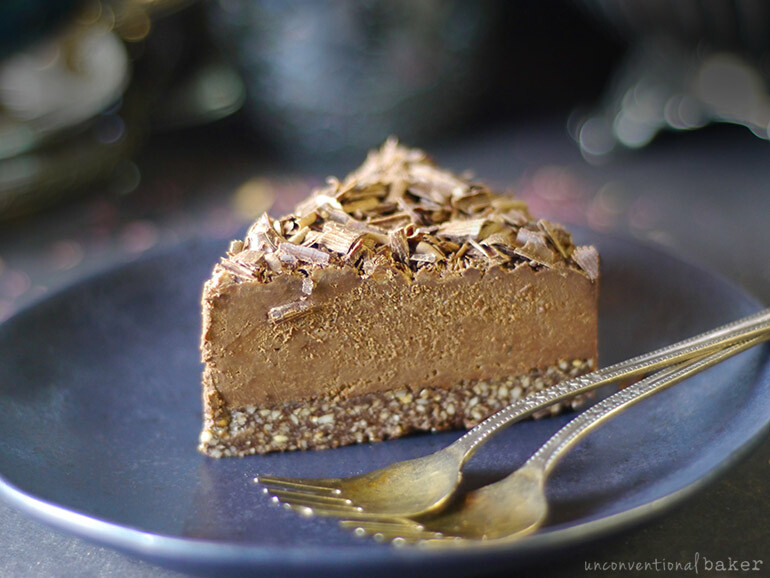 This gluten-free and vegan no-bake chocolate espresso fudge cake is rich, deep-flavored, and perfect for the chocolate lovers out there. 1. To make the crust, add the sunflower seed kernels to a food processor, and process for about 30 seconds or until finely ground into a flour. Add the salt, cocoa powder, and espresso, and process just until combined. Add the syrup, and pulse until it all comes together into sticky large clumps and holds together when pressed between your fingers. 2. Line the bottom of a 6-inch springform pan with parchment paper and spray the sides with nonstick spray for easy removal later. Press the crust mixture into the pan, making a flat, even layer along the bottom but not up the sides. Wipe your processor completely clean. 3. To make the filling, add the chocolate chips and milk to a large microwave-safe bowl. Microwave on HIGH for 30 seconds. Stir well, and then heat in 15-second increments until the chocolate is almost all melted. Stir until completely smooth and no more bits remain. Add the chocolate mixture to the food processor. Add the almond butter, vanilla, espresso, cocoa powder, and 1/8 tsp salt to the food processor, and process for 2-3 minutes or until completely smooth. Scrape the sides, and process once more. 4. Pour the filling over the crust, and smooth the top. Chill in the fridge until completely solid throughout, at least 2 to 4 hours but ideally overnight. Garnish with shaved chocolate curls, if desired. *** Store covered in the fridge. *Or cashew milk, shaken first. **Note: Cashew butter will work in place of the almond butter, just make sure it is the raw variety with no added oils or sugar. To make this nut-free, sub with sunflower seed butter (such as SunButter). Thanks to all the chocolate and since it’s a small amount, the sunflower seed taste is not noticeable. ***Tip: To make the chocolate curls, place a dark chocolate bar on a microwave-safe plate and microwave on HIGH for just a few seconds to slightly soften it. Use a vegetable peeler to shave the edges and create long curls. 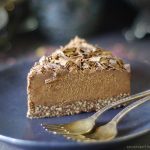 Disclaimer: this post contains affiliate links to the following products: The Vegan 8 cookbook, sunflower seed kernels, salt, cocoa powder, espresso, maple syrup, “lite” canned coconut milk, almond butter, vanilla extract, and food processor. For the new chocolate bar flavor: toasted almond with cayenne. That sounds wonderfully delicious, Kimberly! :) I love chocolate with a bit of a kick to it. Ok, the Mojito chocolate did it — you’re it! :) Absolutely love that idea (and all the other ones too, of course). Thanks for sharing them and enjoy the book! Mmm…there are so many good ideas in these comments! 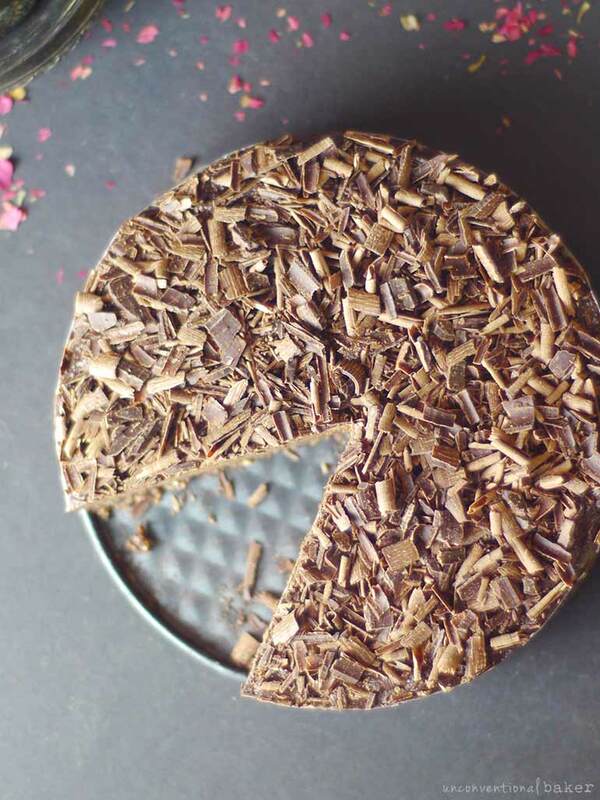 What about Dark Chocolate with Raspberry, Lime and a sprinkle of Black Pepper. Mmm… the black pepper just took this combo up a few notches :) Love it. Thanks for sharing! Pumpkin spice and Chai chocolate bar. Any of the three, these would be some great flavors I would like to see! Love chocolate & beetroot, Iveta. 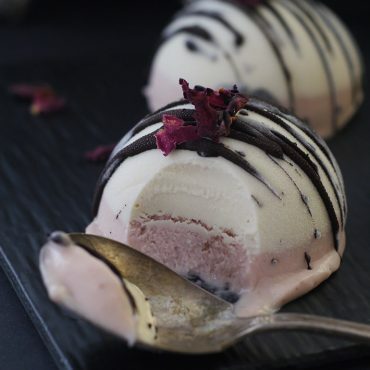 Like in this cake: https://www.unconventionalbaker.com/recipes/raw-chocolate-beet-cheesecake/ or this nice cream bowl: https://www.unconventionalbaker.com/recipes/instant-beetroot-banana-ice-cream/. Trying to imagine how to work beetroot into a chocolate bar now :) Maybe with a layer of pink creme inside…? This cake looks perfect for my family Christmas cake! Right now I’m mad about pomegranates so my chocolate bar suggestion would be dark chocolate with lovely red pomegranate seeds! Oh, I love making chocolate bark with pomegranates as well — so pretty :) Thanks for sharing, Valerie! For a chance to win the recipe book. Mmm.. that sounds absolutely delish, Julie! When I make a “treat” bowl for myself, I put bananas, pecans, cashews, coconut, dark chocolate, and a little almond butter together. Delish! This cake sounds delicious, too, as do many of your recipes. Thanks for sharing with us! How about salted maple pecan? I also think a lemon basil chocolate bar sounds interesting. Love both ideas so much — would definitely be interesting to try those out! I would love a roasted coconut dark chocolate bar! Dark chocolate with passion fruit ganache filling! Chocolate with pieces of dried apples and vegan caramel filling! Chocolate with chunk of mint chocolate cookies! Swirled dark and pumpkin spice latte chocolate! Hi Sarah. Those flavors sound wonderful. The book went to someone else, unfortunately, but the address would not have been a problem. Wish I had more books to share with everyone, so many wonderful suggestions here. Chocolate, sesame and ginger for a vegan chocolate bar. I can’t wait to try Brandi’s recipe. Hi Cecilia. Enjoy the cake! :) Orange and cardamom sound wonderful with chocolate. 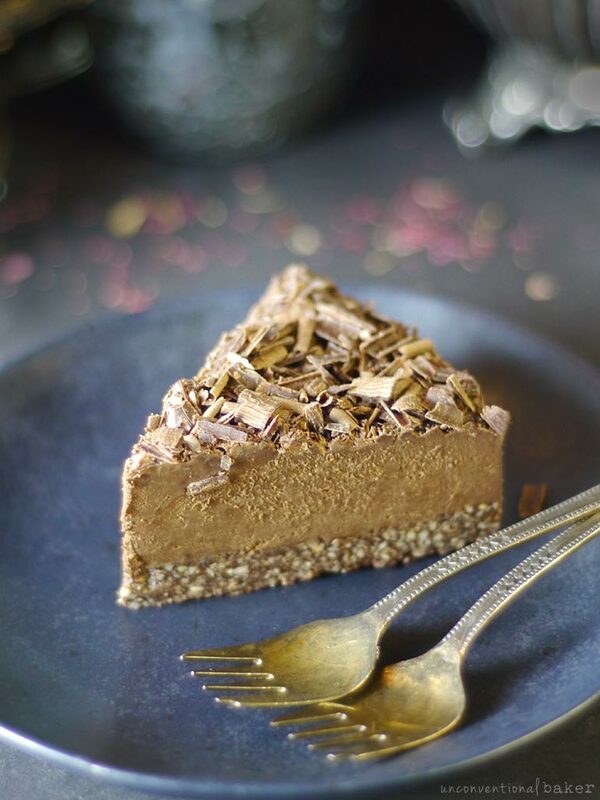 I am going to have a go at this recipe as I love chocolate fudge cake and coffee cake. Hi Nick. Thanks so much — I’m so happy you’re enjoying the book :) And that combo sounds absolutely delicious. Gonna have to try a cake in that flavor one day! This recipe looks right up my alley Audrey! A while ago, I had the fruitiest tasting chocolate ever-it was super unique, and I totally loved it. I make candies with it and pistachios, but now I think a good combo would be pistachio, rose (candied petals?) and maple butter. They’d be really rich and offset the fruitiness. Maybe dried blueberries and candied lemon peels would be a good combo too? hmm. New bar this would be a kumquat/chaga chocolate bar for me – I love citrus with chocolate and the chaga is so addictive! I really love the idea of dark chocolate, key lime and coconut . Adding a little mystery with dark chocolate and zing from key lime zest, this pairing sounds really good to me. Sprinkling toasted coconut throughout this decadent bar would make this dark chocolate, key lime, & toasted coconut bar such a delight ! Chocolate, coconut, and lime is one of my favorite things, Nicole. Key lime would be even better. Love the combo :) There’s a recipe for chocolate & lime cheesecake bites in my book that is one of my favorites. And I used to be obsessed with the Endangered Species sea salt and lime cream filled dark chocolate bars! Oh, Audrey — I’d be so psyched if we get a copy of the book!! Haha. Nothing is too weird. No lie, I gave garlic and chocolate a few tries some years back, convinced it can be made to work somehow. I didn’t succeed at making anything good :P but I still feel like there’s a way to make something tasty out of that somehow..
You wouldn’t think this combo would work for chocolate but it does: coconut curry chocolate. Just the right amout of spice to give the chocolate a nice kick. That sounds lovely actually! :) I’ve made a curry smoothie before that I absolutely loved after a friend gave me the idea, and also incorporated it into fig jam recently. I bet chocolate + coconut + a touch of curry would be wonderful together. I’d like a chocolate coffee cake caramel pecan raspberry struesel bar. Oh, that sounds wonderfully delicious! Haha. That’s true. I would love a chocolate watermelon chocolate bar!! :) Love this idea. This cake looks amazing! Can’t wait to try. My favorite wild chocolate combo is your chaga chocolate from your book haha :D Not trying to plain flatter, I just truly think it’s the best. Other combos maybe: chocolate and lavender, chocolate and sage. I love adding fruit to chocolate to give myself new tasty treats. One of my favourites this summer was chopped bananas and chocolate vegan ice cream, with strawberries. For some reason, I love the combination of these two fruits with the chocolate and this would be great for a new bar. Banana flavoured chocolate with small pieces or strawberry in it. May not be to everyone’s taste but I’d love it!!! Hi Kerry. I’m with you. Chocolate + bananas + strawberries is definitely a classic dreamy combo :) Would be nice to see more commercial bars with it. In the closest town to my old house there was a shop that sold raw chocolates with strawberries and bananas and I loved them: https://www.instagram.com/p/8ylkV5OEDi/ (I shared a pic of them a few years ago on my instagram page).